The Harbour Inn is a well established and well known pub known in the Garlieston area. 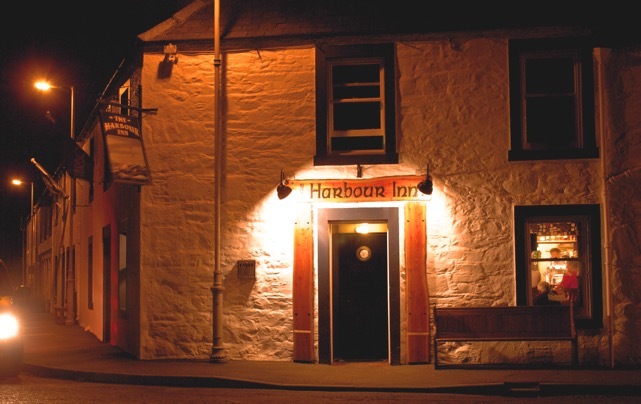 At The Harbour Inn our aim is to provide a reliable, professional and guaranteed service. If you are looking for a friendly pub in Garlieston, look no further than The Harbour Inn. The village of Garlieston is a beautiful harbour village situated on the west coast of Southern Scotland. It is the birth place of the WW11 Mulberry Harbours. The Harbour Inn Garlieston is a traditional Scottish Inn dating back to the 1700’s, overlooking the harbour in the village of Garlieston. It is owned and run by Harry and Carol Lochrie and their family. The Inn boasts a delightful bar, with uninterrupted sea views with roaring fire, vast range of Beers, Ales, Whiskeys, Spirits, Wines and Soft drinks. The two dining rooms are tastefully decorated for lunches and evening meals. All meals are freshly prepared by our Resident Head Chef, Grant and our Resident Second Chef Dylan. Our evening menu boasts a large selection of Starters, Mains and Sweets as well as a Daily Special’s Menu. “ Dylans” Sunday Carvery is served in the “Wheel House” each Sunday and boasts a choice of roast meats with all the trimmings. Outside, there is a large private Beer Garden which is very sheltered and a delightful place to spend a summer’s afternoon. Meals are also served in the Beer Garden. The Harbour Inn has three large en suite guest bedrooms, each with their own unique view of the Harbour and surrounding areas. Come and enjoy a relaxed and friendly atmosphere, whether you are drinking, dining, staying in the guest rooms or simply wanting a cup of coffee.